Fully Revised & Updated Strategies, Tips And Tricks To Help You Sell T-Shirts Online with Merch By Amazon And Print-On-Demand Sites – Even If You’ve Never Sold A T-Shirt Before! Are you a Designer, Illustrator or Artist selling T-Shirts online through sites like Merch By Amazon and Redbubble? Are you struggling to grow your income consistently each month? Do you just want to sell more Shirts? If So – You’re Not Alone! My name is Michael Essek – and for the past 3 years I have been designing and selling T-Shirts online. In that time I’ve grown my income from $50 a month to $10,000 a month and more. (Click here to see a recent breakdown of my income). I believe anyone with competent design abilities can achieve similar – and probably much better – results, thanks to the ever-increasing methods for creative designers to make money selling their artwork online. You just need to understand the key principles and strategies that will help you grow a succesful and sustainable online T-Shirt business. New designers and non-designers alike are flooding in – making it all the more critical that you have an advantage over the competition. 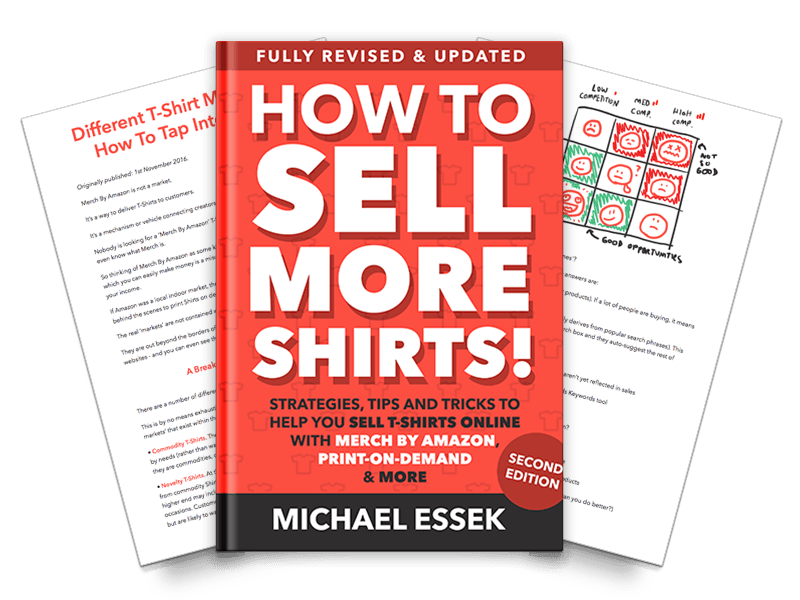 How To Sell More Shirts [Second Edition] outlines the strategies, principles and mindsets – plus practical tips and tricks – that will help you think and design for long-term sales and recurring income. It combines over 16 weeks worth of my secret weekly newsletter content, compiled and edited for easy reading and quick application – and now fully revised and updated for 2017 with 6 NEW Chapters. 15. How Can You Generate More Sales On Merch By Amazon? I believe in the quality of my material. And I want you to have the chance to learn, put this stuff into practice – and see the benefits for yourself. So if for any reason you aren’t happy with your purchase, just email me within 30 days and I will refund you right away.